A coronal hole on the sun can be seen in this image from April 10, 2018, taken by NASA's Solar Dynamics Observatory. 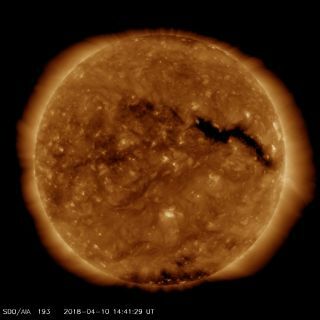 A massive "hole" on the surface of the sun has unleashed a strong solar wind that scientists say may amp up the northern lights in some areas of the U.S. and could disrupt satellite communications over the next few days. Space-weather forecasters predict that the class-G1 magnetic storm (a minor storm) may have a slight impact on Earth's power grid systems, spacecraft and satellite operations. In addition, skywatchers in areas of the northern United States — such as northern Montana, North Dakota, Minnesota, Michigan and Maine — could see amplified auroral displays, according to the SWPC. Images from the Solar Dynamics Observatory identify a dark patch on the sun's surface as the location from which the solar wind originated, according to Spaceweather.com. You can see more current views of the sun on the observatory's website here. Aurora projections for April 10 and 11, 2018. When solar material hits Earth's magnetic field and causes a disturbance — also known as a geomagnetic storm — it can trigger radio blackouts, interfere with power grids on Earth and affect satellites in orbit. Such a storm can also amplify Earth's auroras, making them visible in lower latitudes than usual.